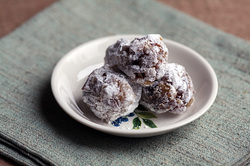 In a large bowl, combine egg replacer, sugar, walnuts, dates, coconut, vanilla & almond extract and mix them together. Let mixture cool, then form into small balls and roll in powdered sugar. In a large frying pan, cook the onions and garlic in most of the cooking oil for a few minutes. Crumble the tofu using your fingers into the pan and stir up. If you are using polenta (it really makes it wet, like scrambled eggs, but we only use this recipe when we have leftover polenta) add this in and stir the mixture. Next add the margarine, let it melt and stir so that it is coating the tofu crumbles. Add in the tumeric and nutritional yeast (optional) and once again stir. Add in most of your veggies. If you are using veggies that cook longer such as broccoli, carrots, or potatoes you want to let them cook for about 10 minutes before adding in veggies that cook fast including mushrooms, kale, spinach, and tomatoes. You should cook the whole mixture for about 15 minutes. Turn off the heat and let it stand for a few minutes before serving. Serve with fresh veggies, ketchup, hot sauce, or with hashbrowns/homefries. Preheat oven to 375 F. Line a baking sheet with parchment paper. Oil a ¼ cup measuring cup and set aside. In a large bowl, mix together the dry ingredients, except the margarine. Cut in the margarine with a fork or your fingers until the texture is crumbly. In a separate bowl, whisk the wet ingredients. Add the wet ingredients to the dry, lightly stirring until combined. Do not overmix. Using the ¼ cup measuring cup, drop dough onto the parchment with one to two inches between each. Bake for 20 minutes or until golden brown. These are best served warm. Serve with jam or margarine. Start by mixing the marinade for the tofu in a bowl. Slice as much extra firm tofu as desired and marinate for about 15-20 minutes. While marinating, cover asparagus with olive oil and salt and pepper. Bake in the oven at 425 degrees until bright green and crispy (will take about 15-20 minutes). 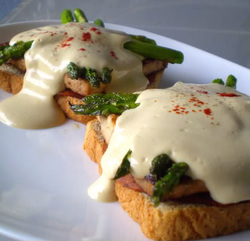 While waiting for the tofu and asparagus, you can blend all the ingreidents for the hollandaise sauce in a blender and set aside. Toast your bread of choice and grill a couple of slices of ham on a grill pan over medium heat. After that, you can set the ham aside and grill the tofu slices until nice and browned and crispy. At this point, all you need to do is assemble your egg-less Benedict and sprinkle the top with a bit of pepper and paprika. Recipe credit to Sammi, founder of the blog Vegan Pandamonium. Put the quartered potatoes in a decent-sized pot and add cold water to cover, and around 2 teaspoons of salt. Place over high heat, cover, and bring to a boil. Uncover, and boil until the potatoes are tender, around 10-15 minutes. Put the shallot and parsley in a medium bowl. Drain the potatoes, and, while they're still hot, add them to the bowl with the shallot and parsley, and give it all a toss. Add the remaining ingredients, toss well, and let sit at room temperature for at least 10 minutes, until the potatoes have absorbed all the oil and vinegar. Serve warm or at room temperature. Heat olive oil over medium heat, and saute onions and garlic until translucent, about 2 minutes. Add spinach and cook until wilted. Season with salt and pepper. Grind the cashews in food processor until very fine. Add tofu, nutritional yeast, soymilk and tumeric. Blend until you have a creamy, even consistency (add more soymilk if needed). In a mixing bowl, combine the onion mixture with the tofu mixture. Season with salt & pepper. If using puff pastry dough, lay it in a pie plate or other oven-safe dish, creating a border around the edges. Pour the tofu mixture into the dish and spread it evenly. Sprinkle with paprika and top with tomato slices. Bake in oven for 30 minutes, or until mixture is set and crust has browned.